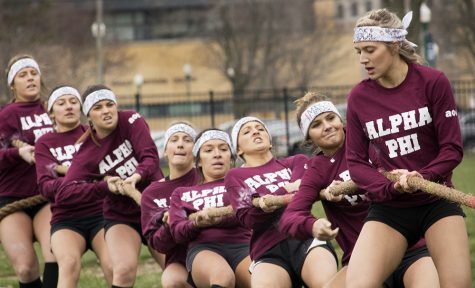 Members of the Alpha Phi sorority compete in the Tugs competition on Wednesday at the Campus Pond. Alpha Phi beat Sigma Kappa. 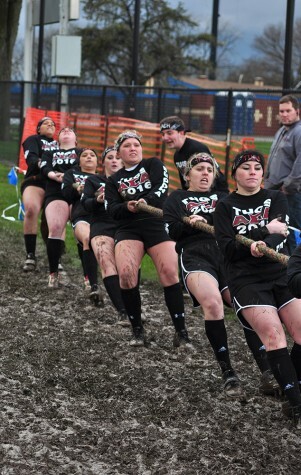 Rain, mud and sweat covered the field near Campus Pond Wednesday as 14 teams competed in the second round of Tugs. Though the odds were against them the teams gave it their all, beating the slippery mud and tugging their hearts out for the chance to win. 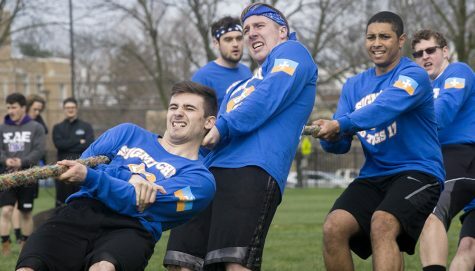 Despite the rain and chilly air, Tugs spectators, wearing the pride for their respected sororities and fraternities on their sleeves, continued to cheer and smile. Daniela Cicio, a sorority member from Delta Delta Delta who is on the steering committee for Greek Week, said there was the same amount of hype for Tugs regardless of the rain. 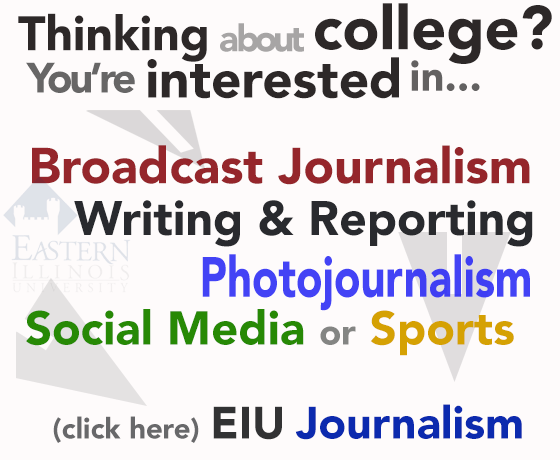 Originally set to start at 4 p.m., Wednesday’s round of tugs kicked off at 5 p.m. in the hopes that the rain would ease up. 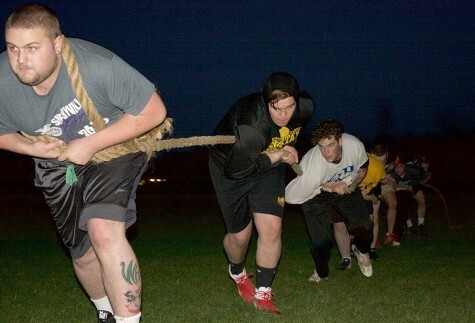 The first fraternities to compete in the Big Men’s Tug were Sigma Pi against Phi Kappa Theta, with Sigma Pi taking the victory. Zachary Wollenschlager, who led the rope line for Sigma Pi, said his team has been training for three months and go out of their way to tug every day. Wollenschlager said the one thing going through his mind while he was leading was to just pull the other team into the pond. 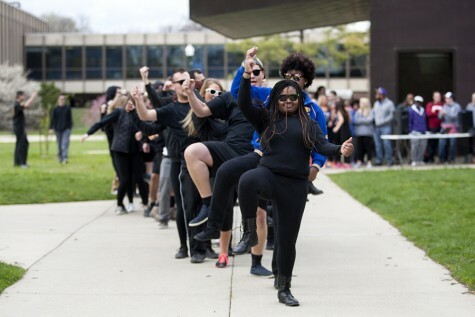 Members of the Alpha Sigma Alpha sorority compete in the Tugs competition at the campus pond outside of Lantz Arena Wednesday. 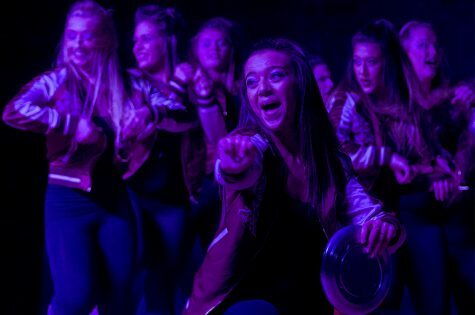 Alpha Sigma Alpha beat Delta Delta Delta. Sigma Nu faced Delta Tau Delta in the second Big Men’s competition and Lambda Chi Alpha was pitted against Delta Chi in the third round. Sigma Nu and Lambda Chi Alpha won the tug. Mark Galvan, the leader of the rope line for Sigma Nu, said he has been tugging since his freshman year and it is a really cool experience. Galvan said his fraternity is like his second family and they are keeping their eyes set and minds focused on Friday’s final Tug competition. Following the Big Men’s Tug, eight sororities showed what they were made of as they competed against each other in the Women’s Tug match. Sigma Sigma Sigma and Alpha Gamma Delta were the first teams to take the rope with Sigma Sigma Sigma taking the first women’s victory of the evening. Sigma Sigma Sigma won the championship for the Women’s Tugs last year. 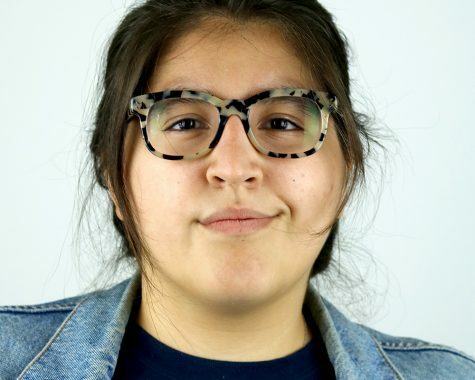 Alicia Aguilar, the front-runner for her team, took Sigma Sigma Sigma one step closer to another championship. “I could see (the other team) in the front, and I was like ‘We’re almost there, we got this,’” Aguilar said. Aguilar said her team strives to never panic, keep calm and never give up. 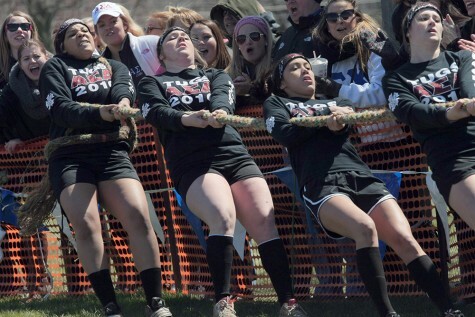 Alpha Sigma Tau dragged Sigma Kappa into the pond during the second Women’s Tug competition. Ashley Fouch, the front-runner for Alpha Sigma Tau, said although the rope was heavy she really wanted to get a win for her team. “Being the front person you just got to make sure you’re straight so that was in my mindset and I knew my team had my back,” Fouch said. Fouch said this is her first year competing in Tugs with her sorority and has a positive mindset for Friday. Alpha Phi won against Kappa Delta and Alpha Sigma Alpha won against Delta Delta Delta. 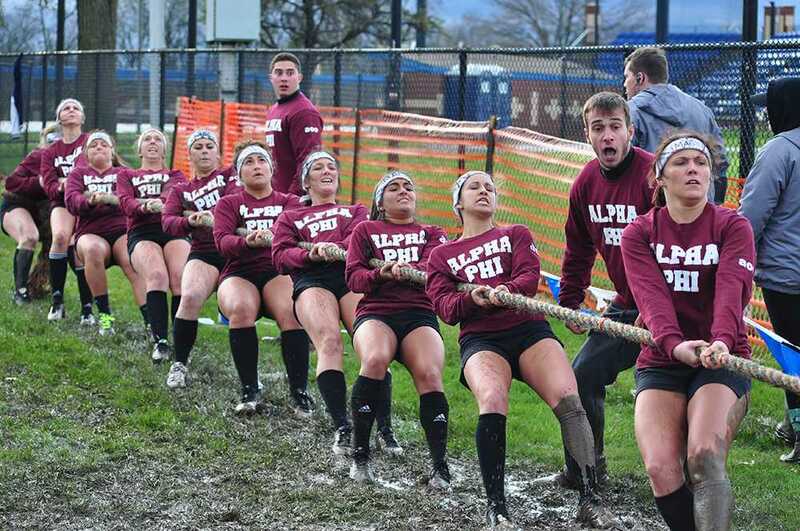 Abriana Vesconte, a sorority member from Alpha Sigma Tau, cheered her sisters on and said Tugs was a way to unite the different organizations and the rain did not stop that.